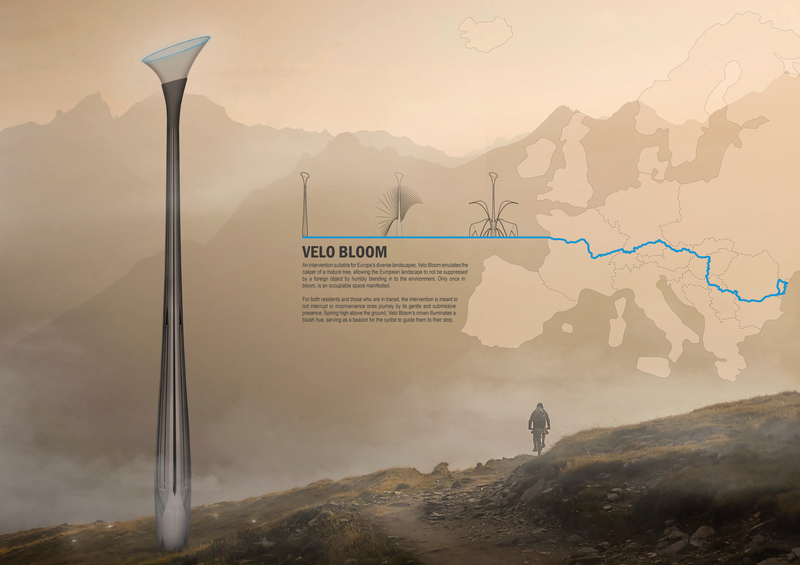 The EuroVelo 6 bicycle route spans 3,600 km and 10 European countries, running from the Atlantic coast of France, to the Black Sea in Romania. 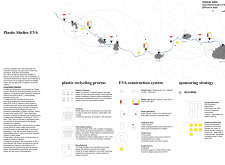 Also known as The Rivers Route, it follows the paths established by several of Europe's major rivers: in France, the Loire; in Germany and Switzerland, the upper Rhine; and, stretching across the entirety of eastern Europe, the Danube. 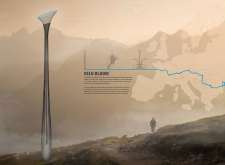 The EV6 is one of the most popular routes in Europe for velo tourism, a sustainable and increasingly popular method for cyclists to visit and experience cities and countrysides. 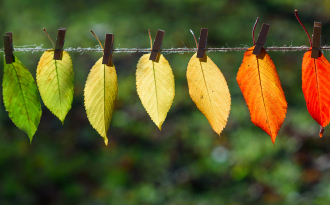 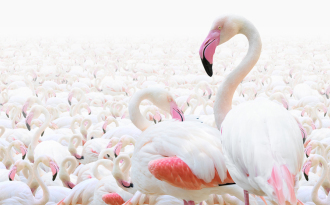 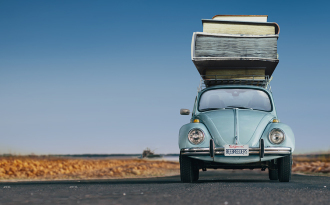 There are of course health benefits to this type of tourism for individuals, as well as social and financial benefits for countries that host popular and safe routes, which attract regional and foreign visitors to cities and towns along the trails. 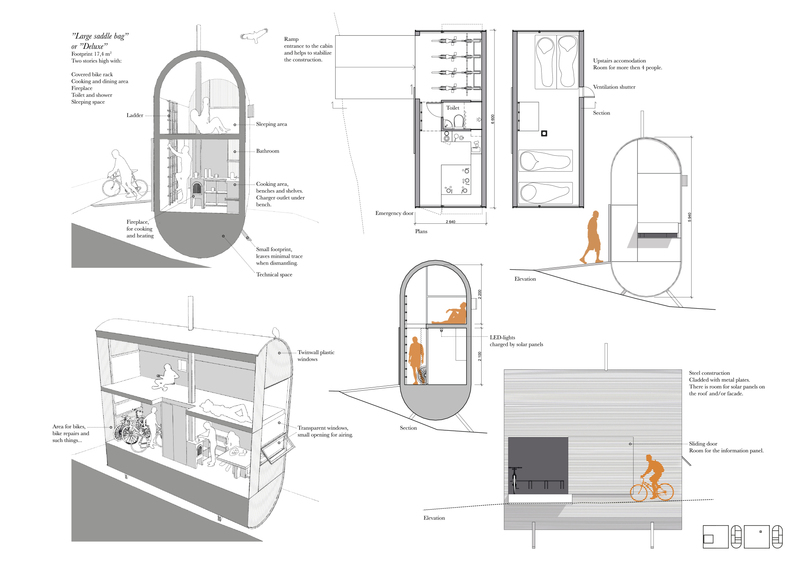 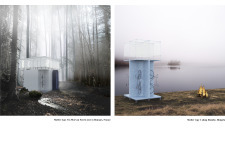 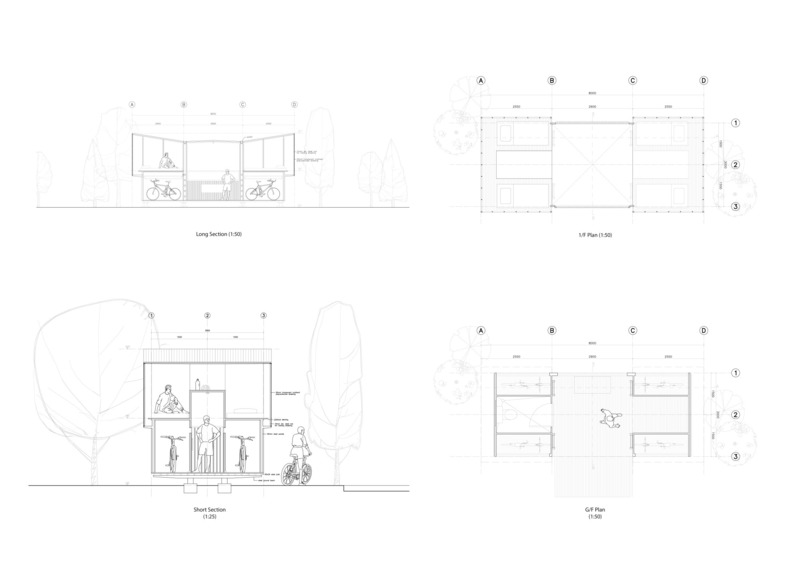 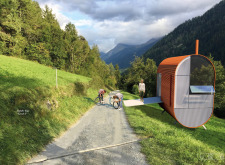 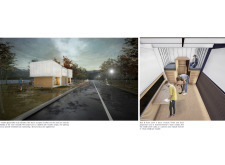 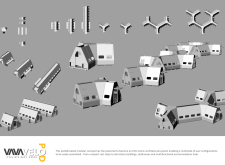 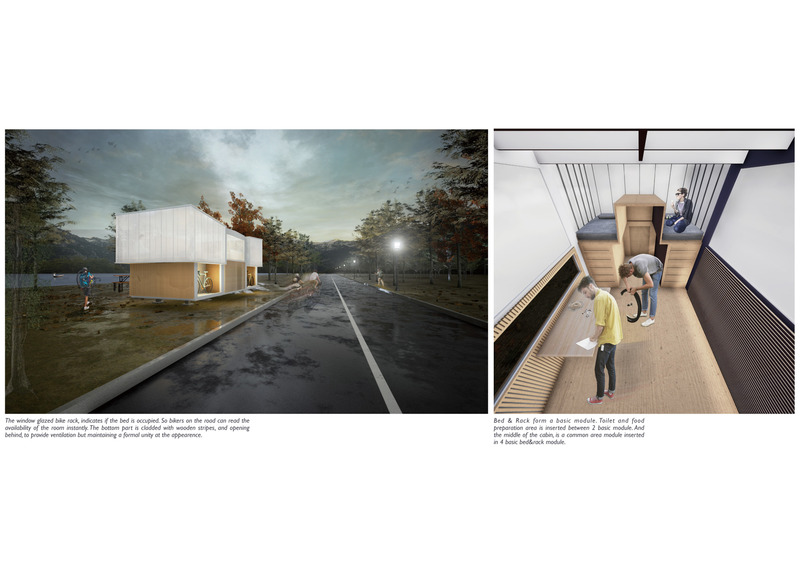 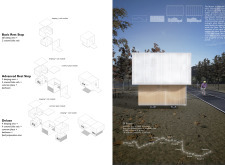 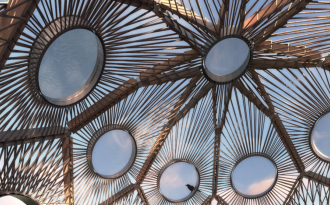 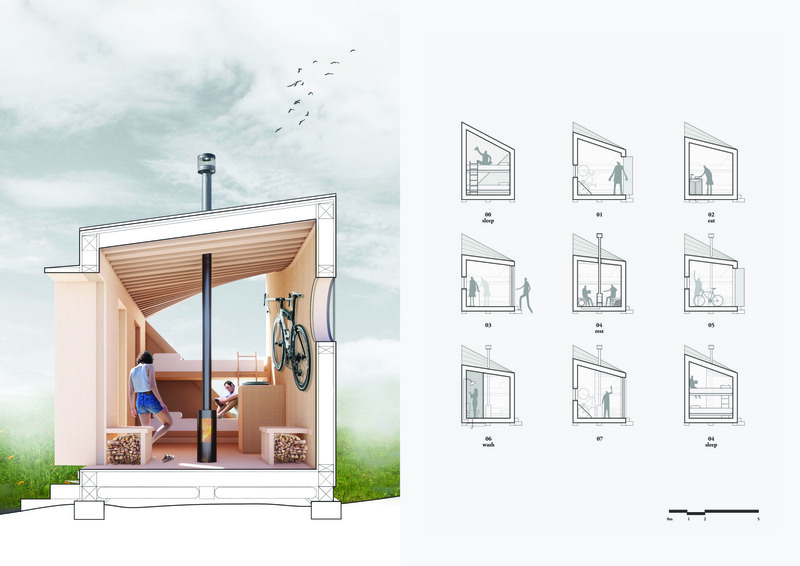 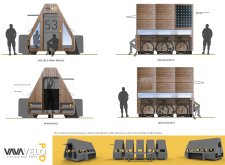 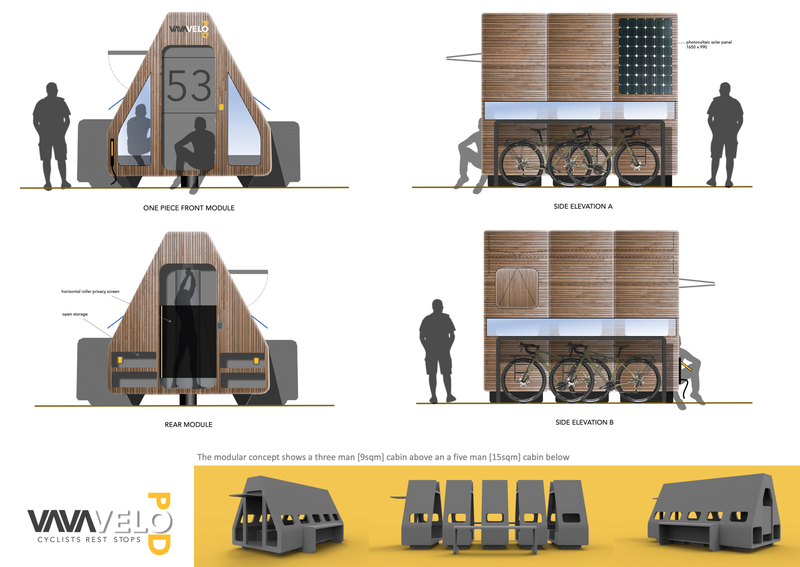 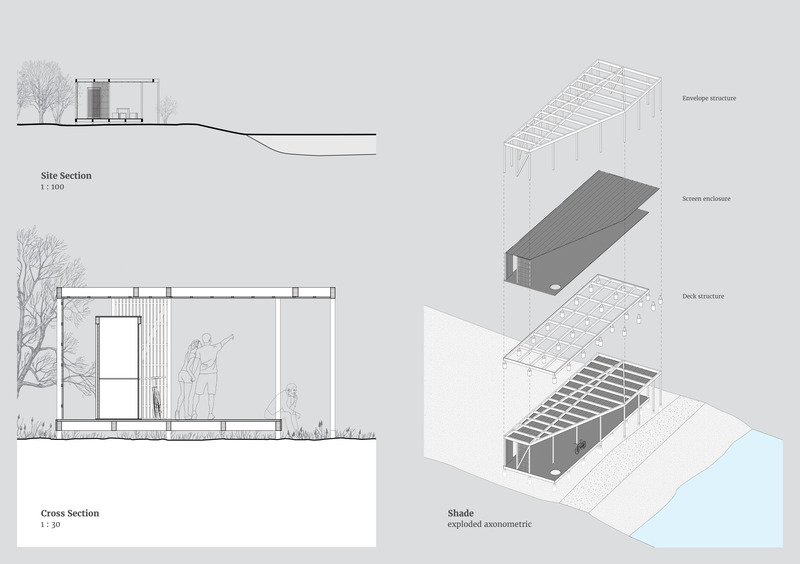 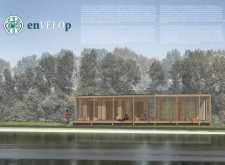 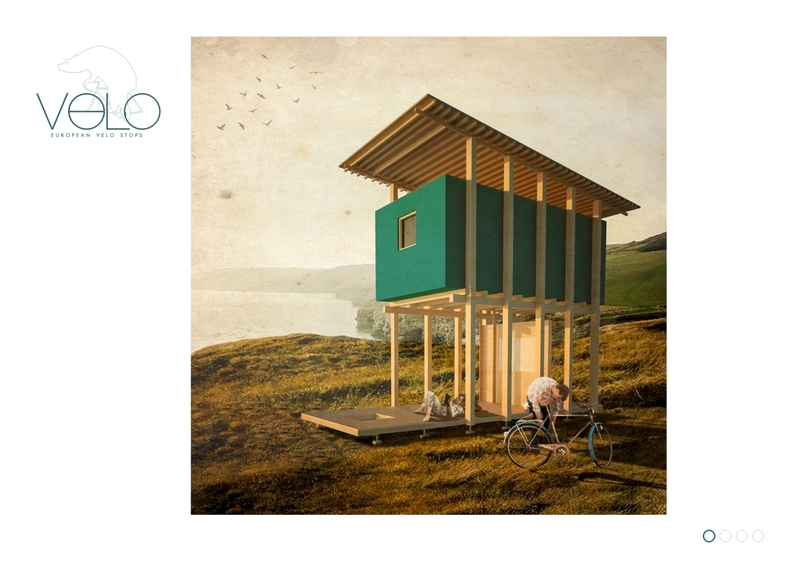 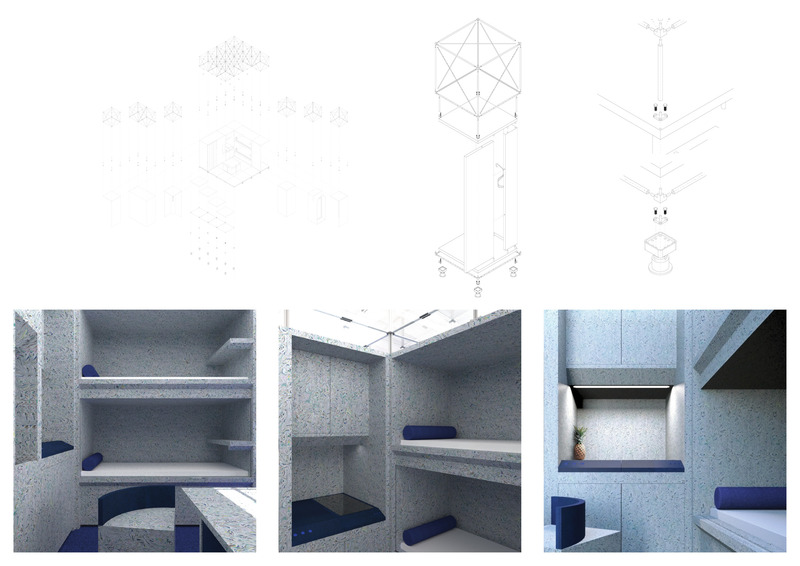 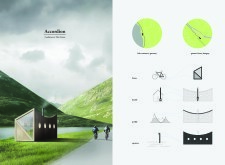 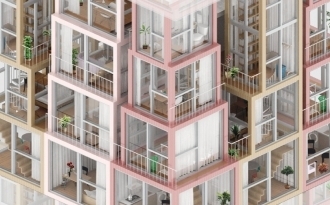 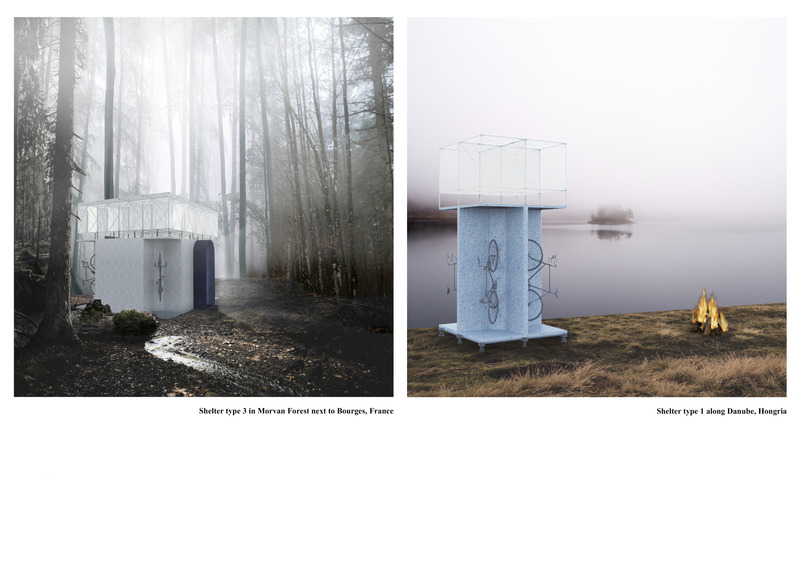 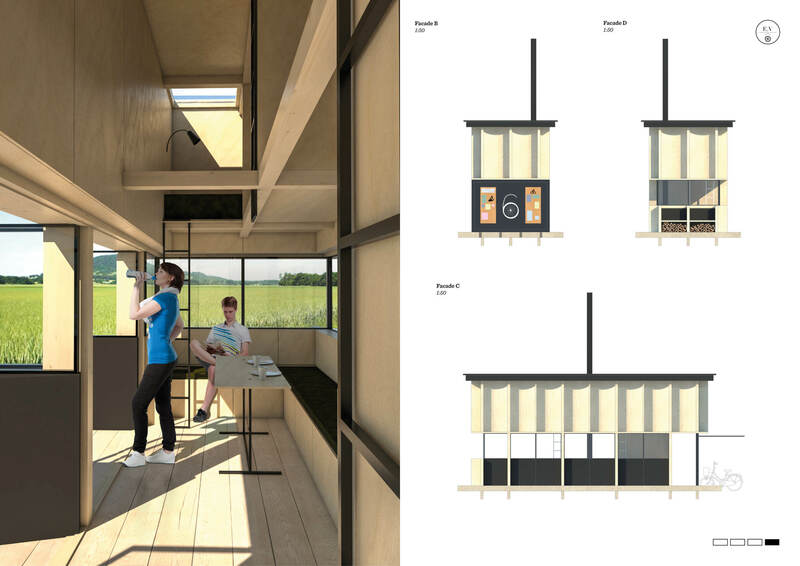 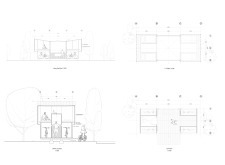 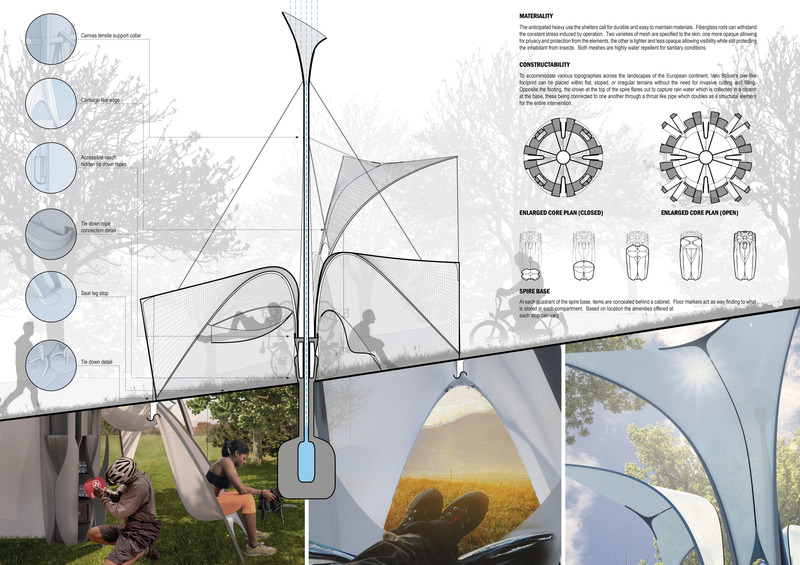 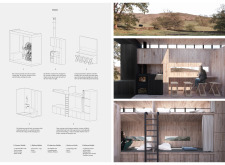 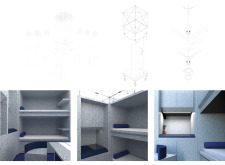 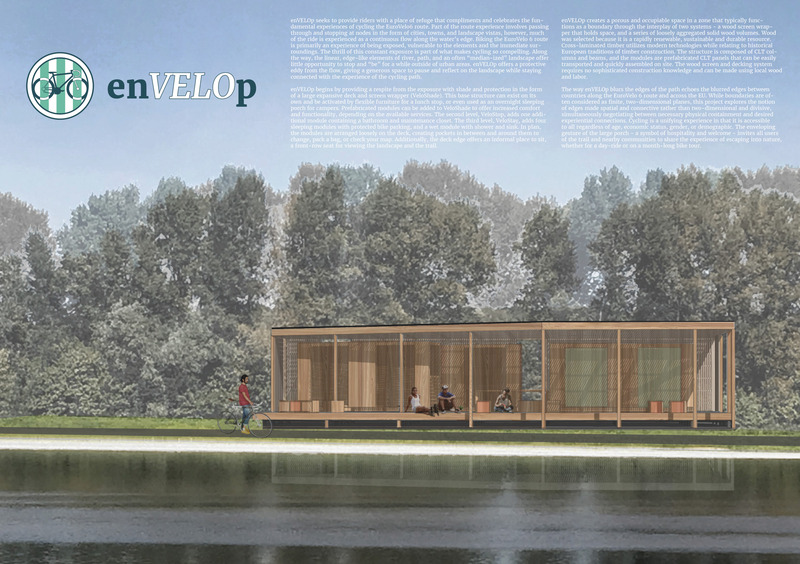 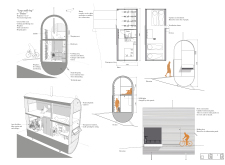 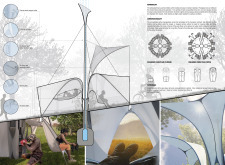 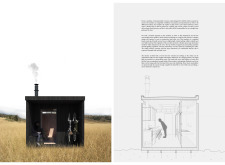 Bee Breeders’ European Velo Stops competition tasked architects with designing a series of cost effective, environmentally responsible, and energy-efficient cabins for overnight stays along the EV6 route. 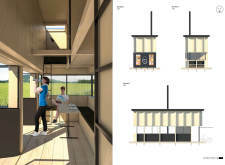 The brief requested that designs be easily-constructible and space-efficient. The cabins are intended as a chain of small and recognisable structures spanning the EV6 and providing cyclists with places to stay overnight, directly alongside the bike route. 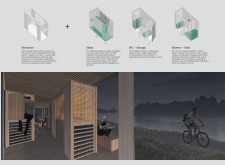 Whether a cyclist has covered 10km or 100km in a day, there are some basic needs he or she will need for a night of shelter, as a place to rest both indoors and outdoors while protected from the elements. 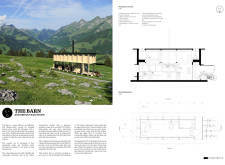 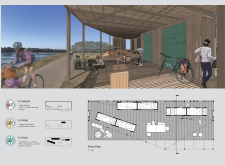 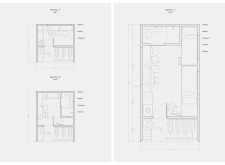 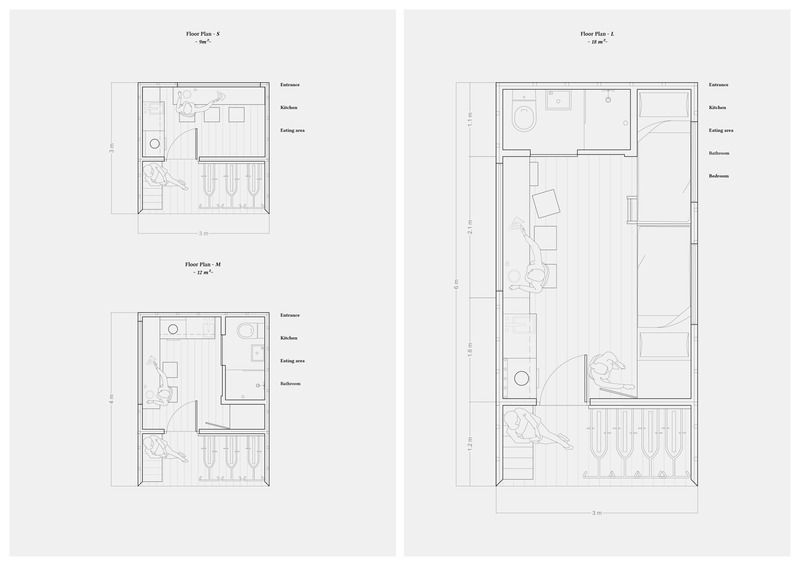 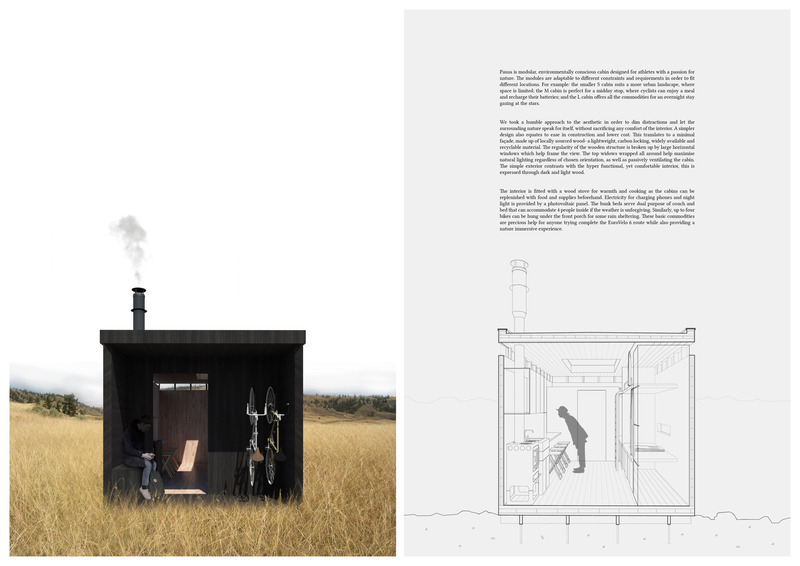 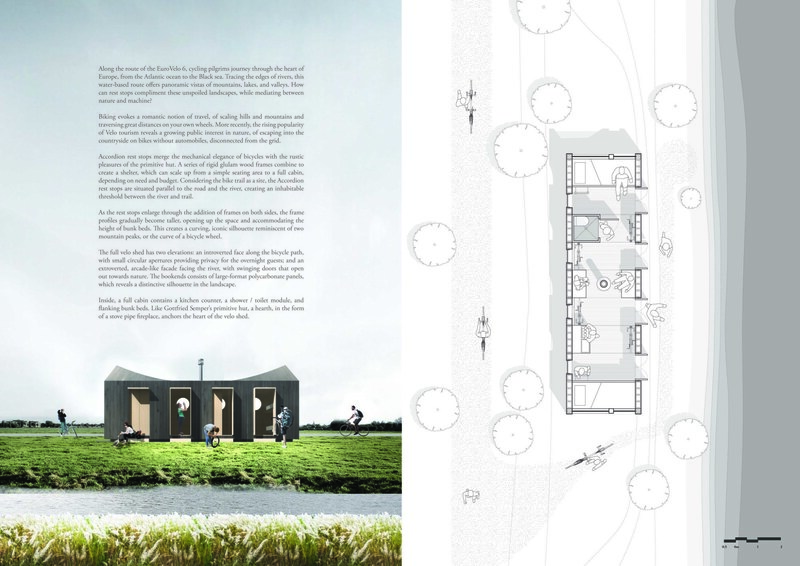 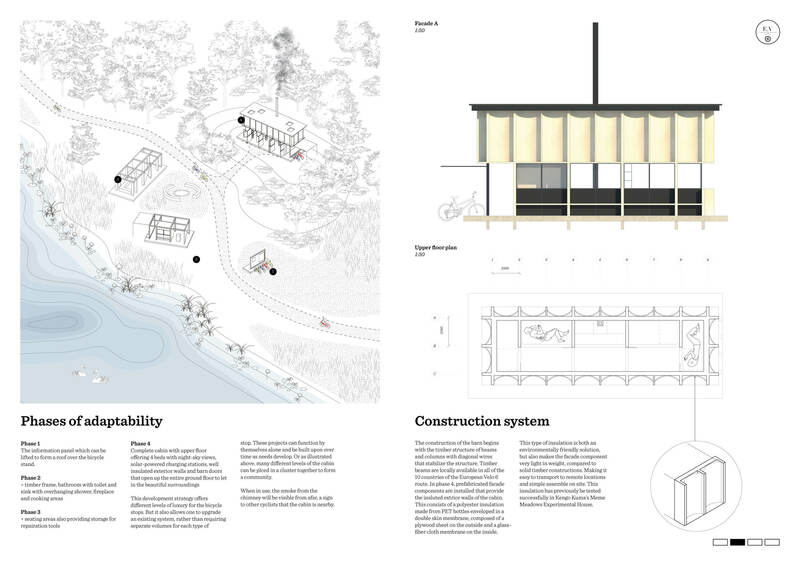 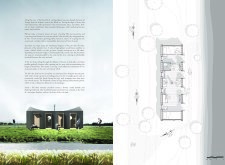 The cabin designs were requested to include space for up to 4 cyclists and their bikes, a toilet and shower, a counter for food preparation, an information panel for maps or other documentation, and some consideration for amenities within the immediate landscape, such as benches or exterior fire pits. The jury considered each proposal for these requirements. 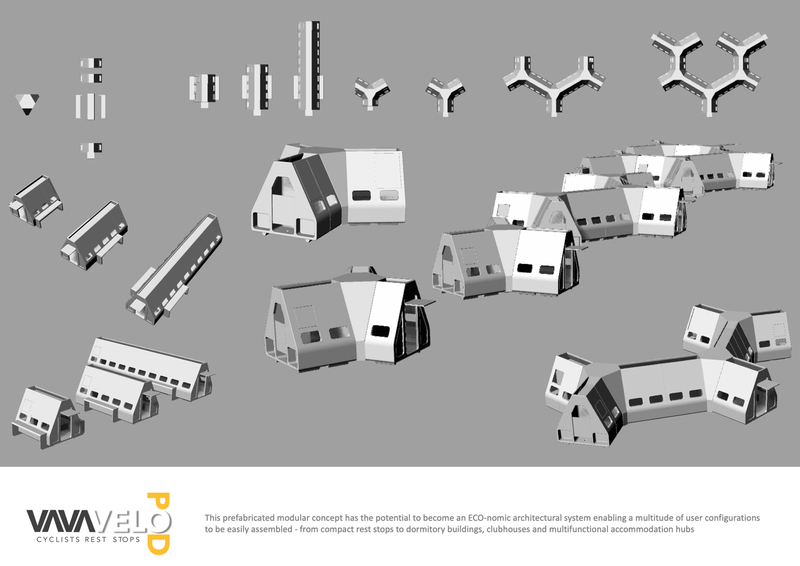 Questions that came up included: What is the correct scale for such a shelter? 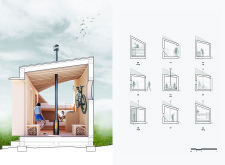 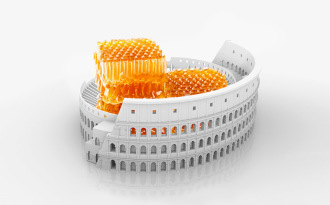 Can it be mass-produced or easily constructed using local materials? Has the design introduced some innovative element that separates it from the typical A-frame or lean-to structure common for housing cyclists or hikers? 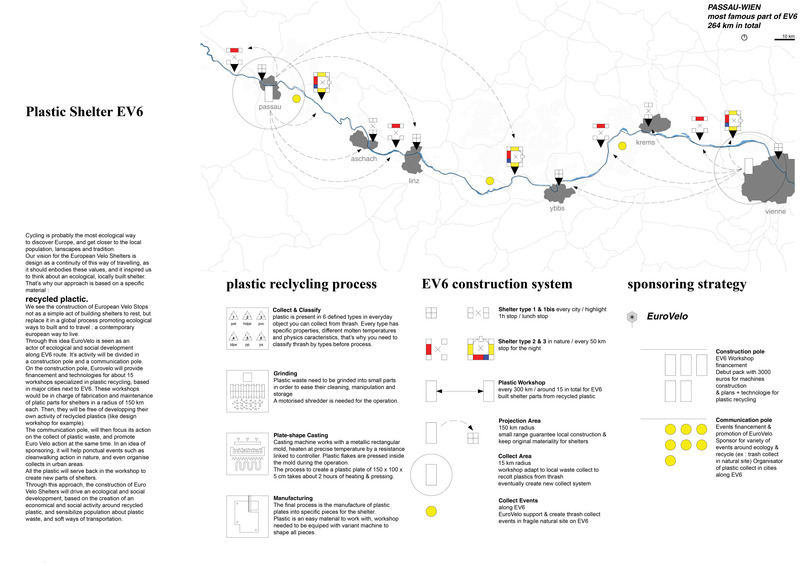 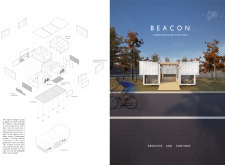 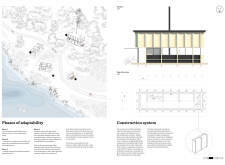 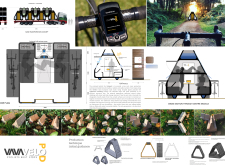 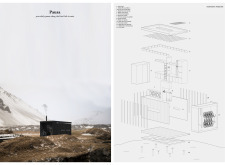 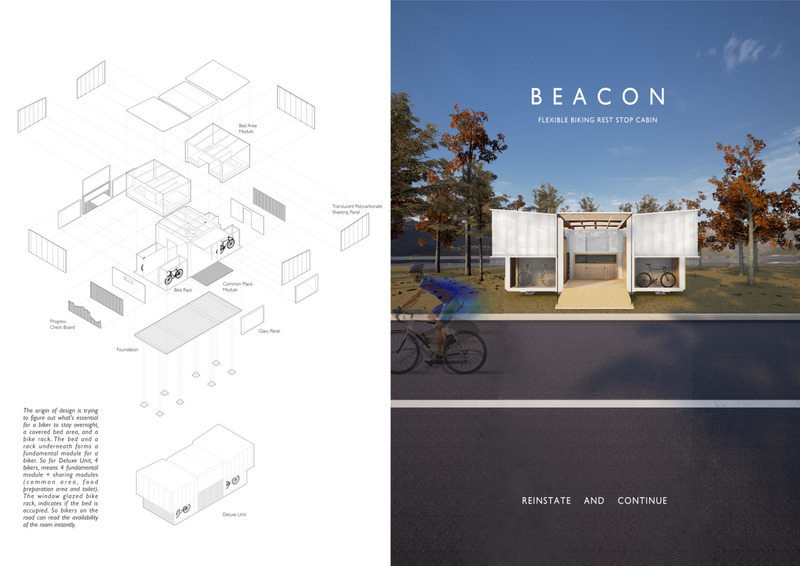 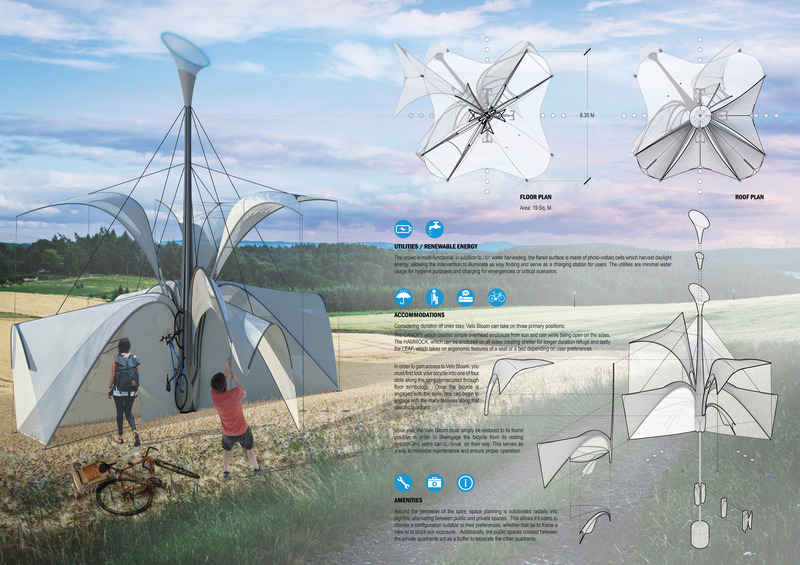 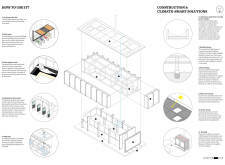 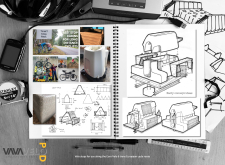 Submissions included ideas ranging from mobile applications to manage and locate the series of velo stops, methods for recycling and reusing materials sustainably, and solutions for both pre-fabricated or site-constructed cabins to be implemented in any of the ten countries that comprise the EV6. 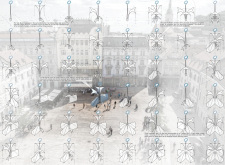 Bee Breeders would like to thank each participant for their work. This is one of several competitions Bee Breeders has organised seeking designs for ‘small-scale’ temporary shelters, and it finds that new ideas are always being proposed. 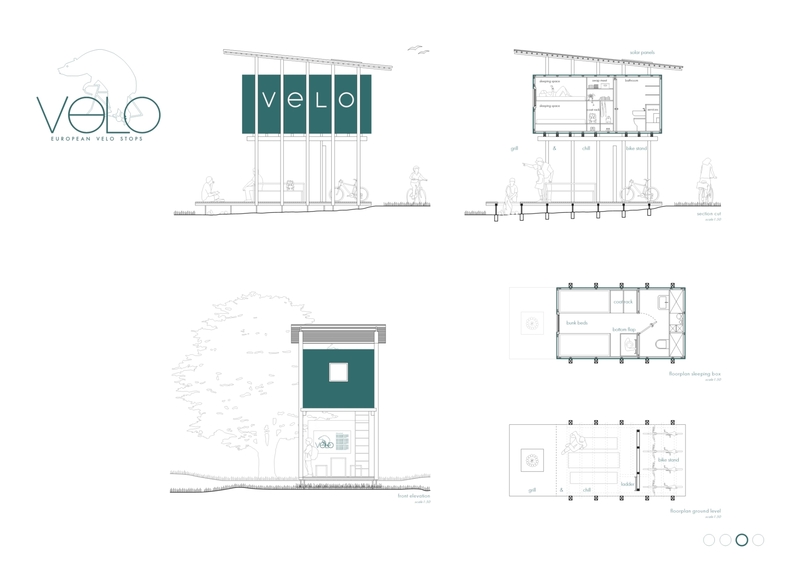 How Do Bicycles Influence The Architecture Of Cities? 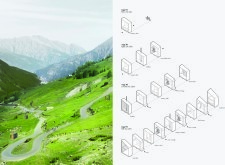 The project considers the 5-member form of a typical bike frame as its primary structural element. 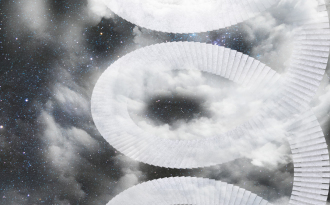 It then lays out the structure linearly with slight dimensional variations to create a simple and identifiable wave-like form that is reminiscent of a pair of mountain peaks. 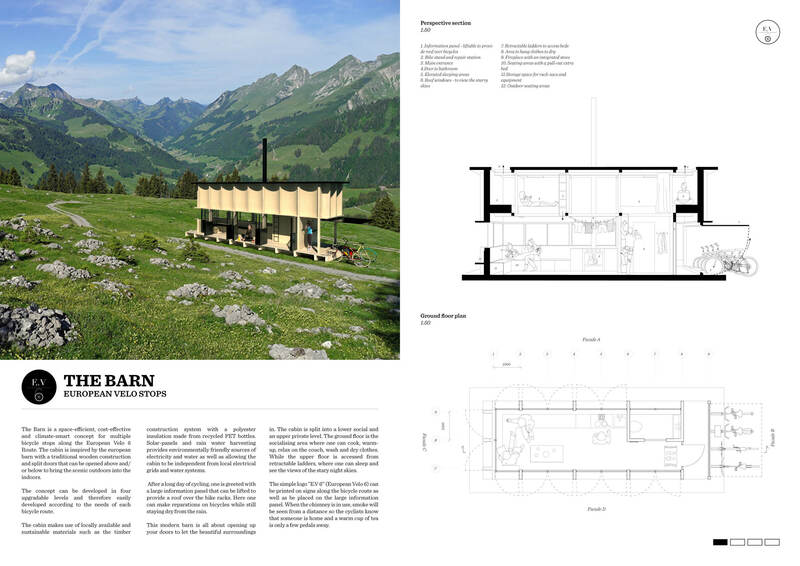 ‘Accordion’ presents a compelling design of glulam wood and transparent polycarbonate windows, and the submission compares itself to the ‘primitive hut’, a rustic solution for man’s basic needs. 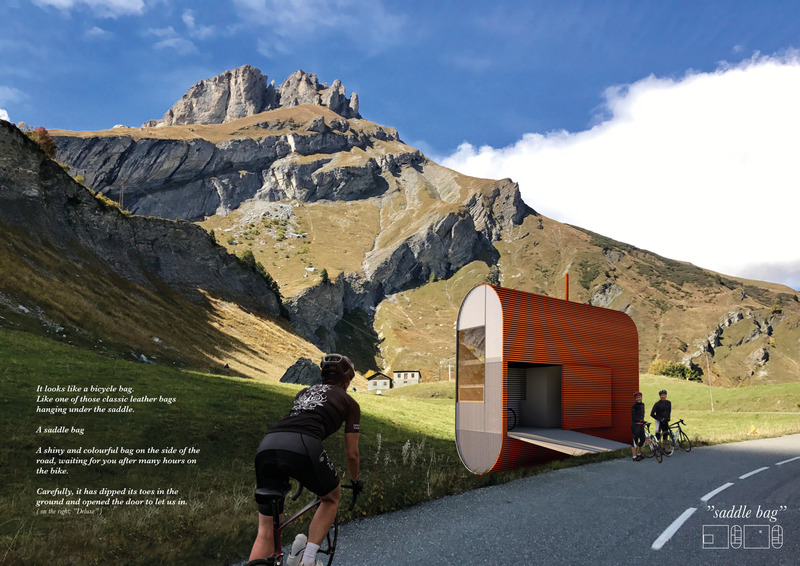 The design certainly seems feasible to achieve, and one can imagine a cyclist’s satisfaction upon turning the final corner of the day’s ride to find this comfortable shelter awaiting them. 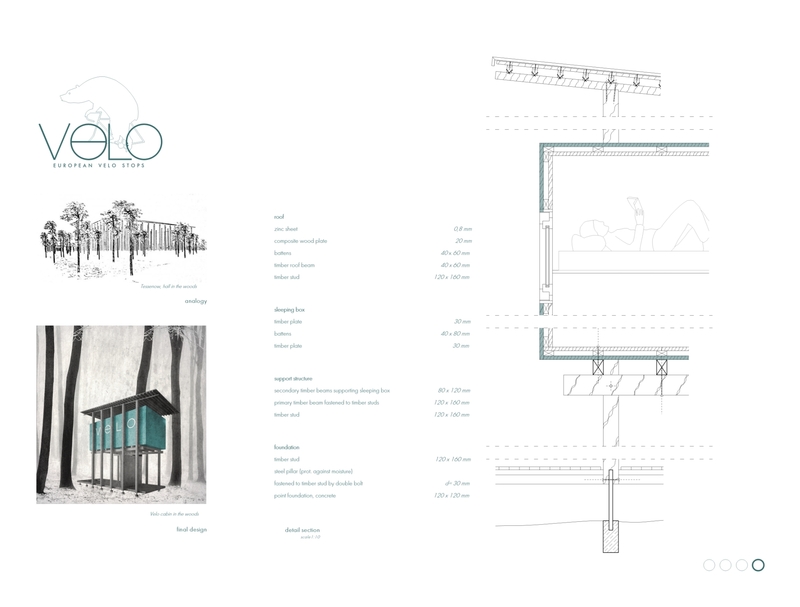 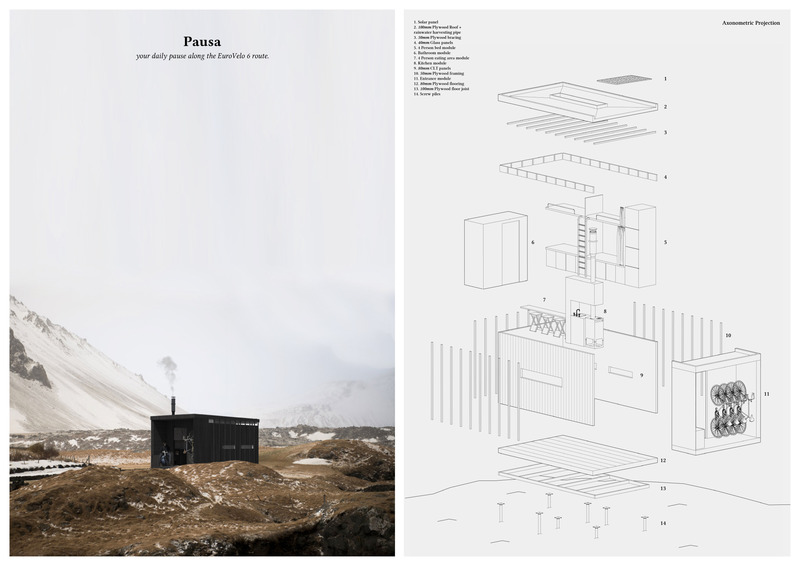 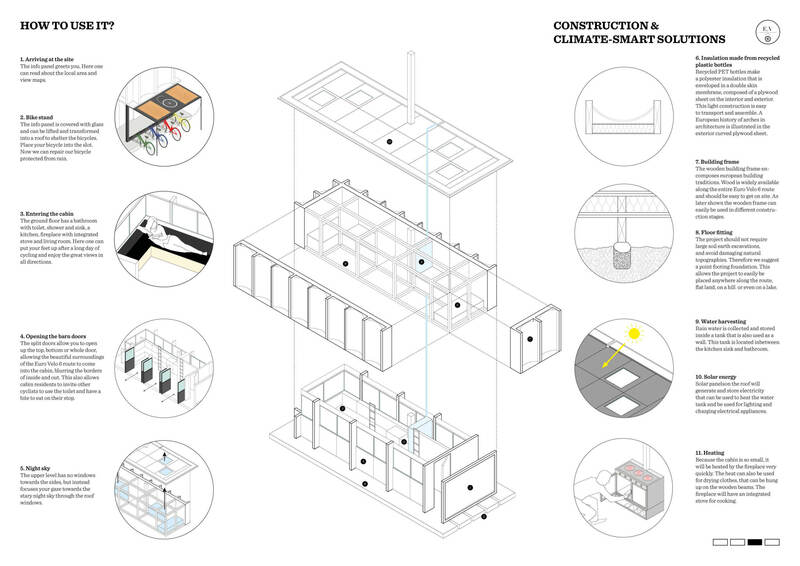 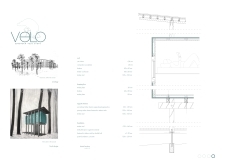 This project was special in its advanced level of detailing, minimalist drawings, and powerful images. 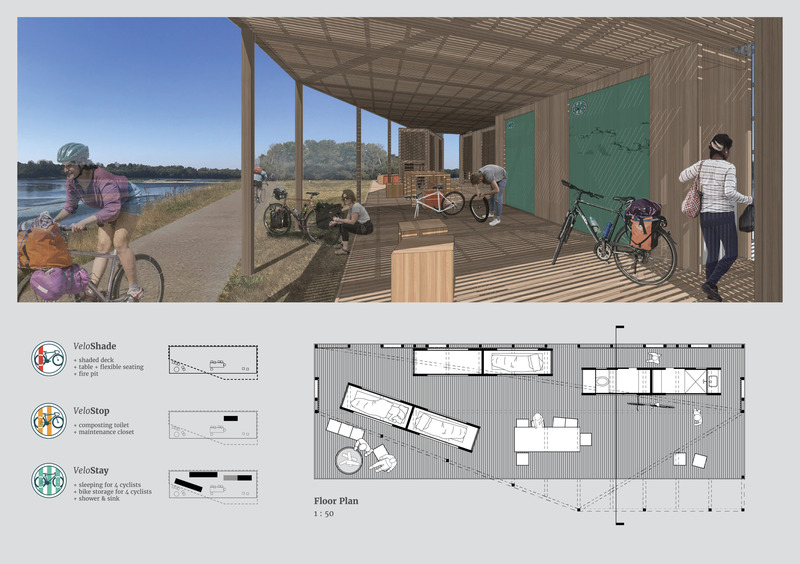 It features a two-story structure made of timber, an angled roof for drainage and solar panel placement, and both indoor and outdoor spaces for cyclists. 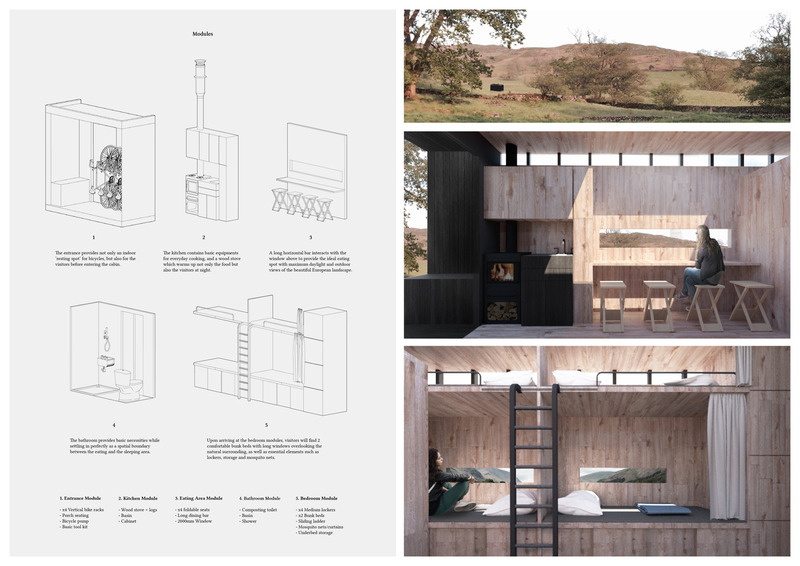 By placing sleeping spaces on an upper level, it keeps inhabitants and the structure dry, while simultaneously providing a protected outdoor space below. 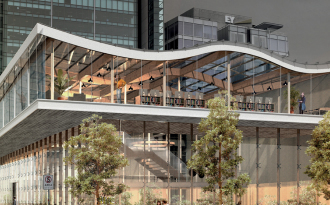 The jury questions the structural capacity of the cabin (additional framing elements would likely be required in the short-span direction to resist high winds), as well as whether the bikes are protected enough from theft. 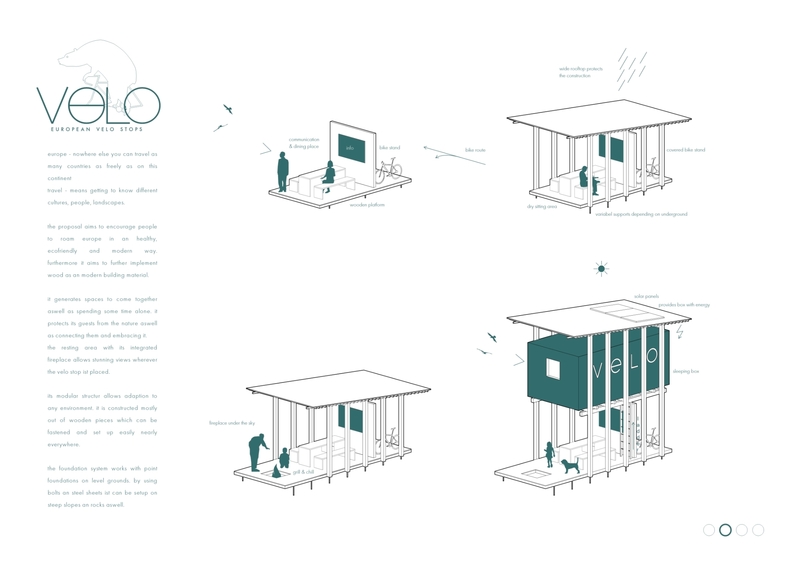 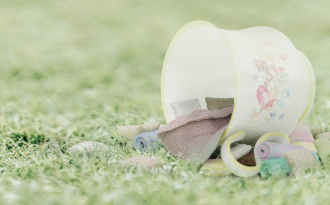 The submission nevertheless represents a great project. 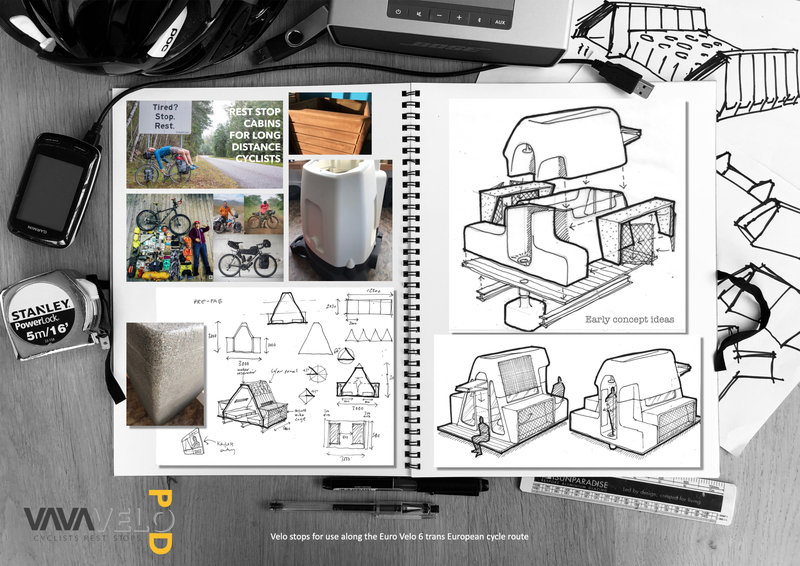 Designed to mimic the shape of a cyclist’s saddle bag, this project offers perhaps the most stand-out form of all the submissions. It features an enclosure of twin-wall polycarbonate and metal, both recyclable materials. 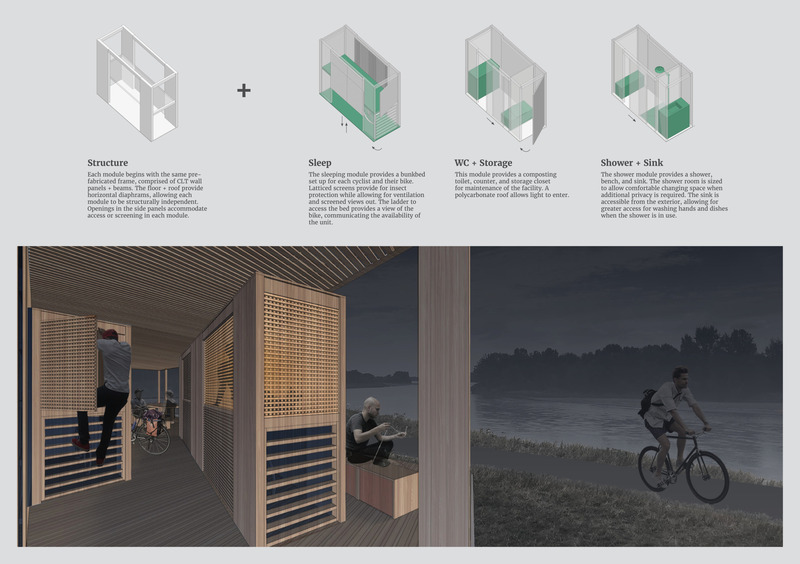 The side door slides shut at night to protect the bikes as well as the cyclists within. 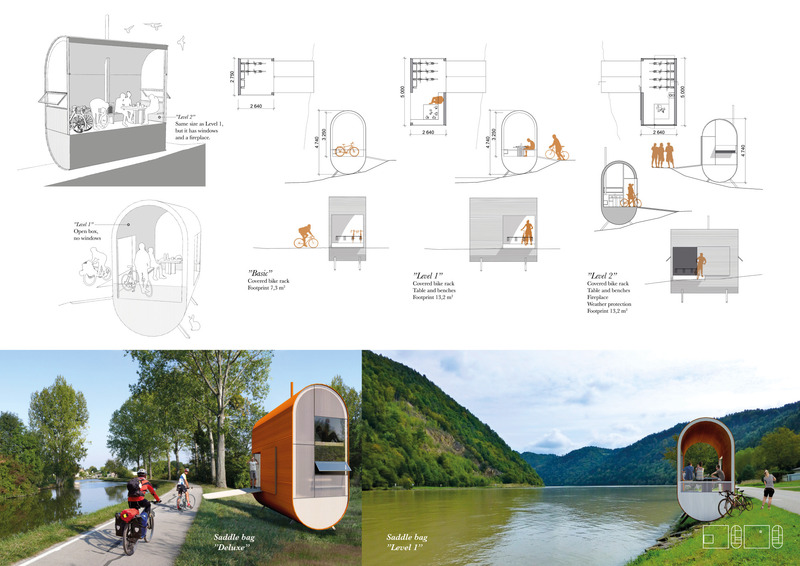 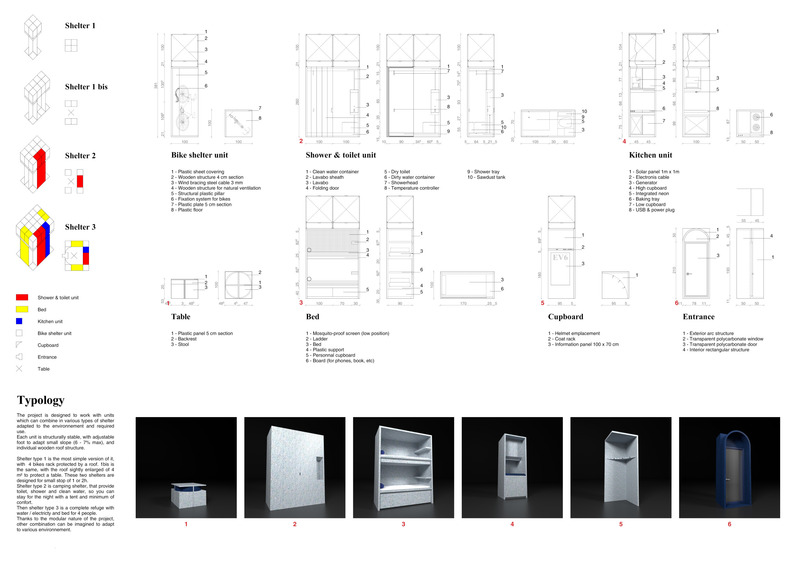 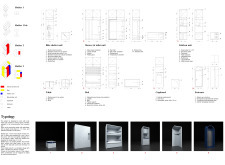 Its compact form provides a no-waste spatial solution for up to four people, and offers various versions of the design and program for different capacities and uses. 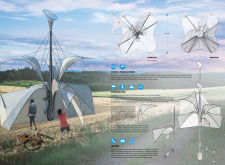 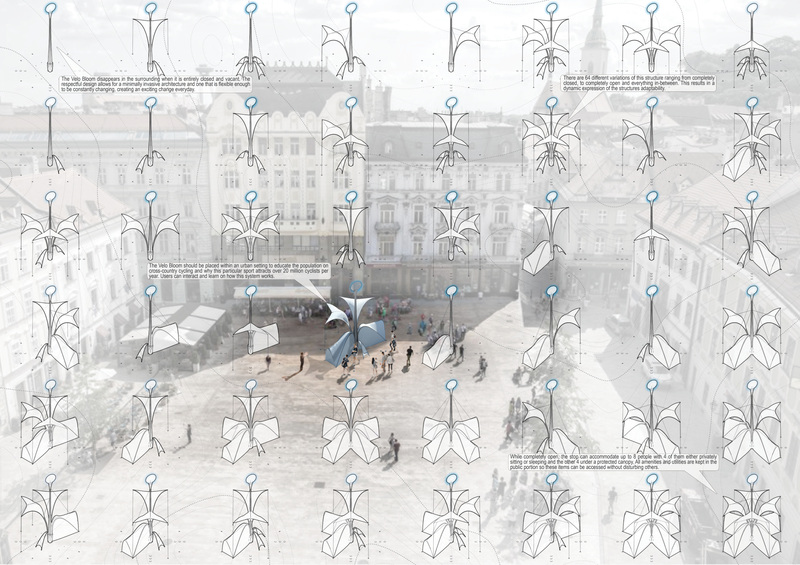 While the pill-shape section of the structure provides well-considered headroom within that is also self-draining against exterior rain, one might question the shape of its lower-curved half, which is labeled ‘technical space.’ The images and drawings are striking and the jury commends this work.